This was the title of an annual comprehensive timetable published from 1969 to 1996 by the Highlands and Islands Development Board in Inverness. 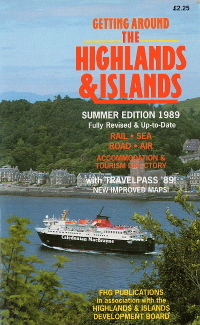 The Board also introduced the Highlands and Islands Travelpass 7 day and 14 day rover ticket valid on trains, ferries and connecting bus services. Although various passes for trains buses and ferries can still be bought, the timetable and separate public transport map are no more. The deregulation of bus services following the Transport Act 1984 made it more difficult to keep up with the much more frequent changes to services. Overall help can be obtained online from the Traveline Scotland service. Most local authorities (though not Highland Council) now publish their own area transport timetables and maps twice yearly: Argyll and Orkney being particularly good examples. Abellio took over the ScotRail franchise in April 2015 and promised to work hard to make seamless door to door journeys possible. The declared intent in the ScotRail special spring 2015 issue of the Abellio Way Magazine is "to address any concerns customers have about changing between public transport services during their journey [using] clear signage, wifi, maps and information [to] help passengers to travel easily." In discussing how well has this been achieved, we have to remember that true transport integration requires many different organisations to pull together. This is easier to achieve in countries such as Switzerland and less so in Britain where the state encourages competition more than co-ordination. A city like Inverness, the hub of a huge area popular with tourists, would be expected to excel at getting people to Loch Ness or to the Culloden Battlefield. Sadly, the arriving passenger has to search all around the station for the information, and some is out of date. The tourist information centre was downsized and moved to the High Street 18 months ago despite FoFNL's arguments that it should be moved to the railway station. The railway's onward travel posters at the station entrances still show it located at Castle Wynd. The posters, in Abellio's soon to be "revamped" station, tell you the nearest bus stop is 100 yards to the west in Union Street which is also wrong. Many of the buses go from other nearby bus stops and some from the bus station. At least there is a real time departure board for the bus station tucked away beside the signposted walkway along side platform six. Unfortunately it only gives the destination of the bus and passengers may not know that Fort William is often the final destination of the bus for the popular Urquhart Castle. Culloden Battlefield is reached from the major bus stop at Falcon Square which is 70 yards distant in a southerly direction (and is the nearest to the station with no roads to cross). Two new bus shelters were installed in November, but the stop has been without printed timetables for the last year. There is now only an electronic display of the next three scheduled buses. A visitor could be waiting for a very long time before a less frequent bus to, say, the Tomatin Distillery is shown. Early 2018 saw a welcome big improvement in Inverness bus stop timetable provision but the 100% coverage claim made by the CEO of Transport Scotland to a very senior MSP is still a significant exaggeration. The bus service between Thurso Station and Scrabster Harbour (for the Orkney ferry) was withdrawn a few years ago. Now the telephone box outside the station seems to have been abandoned. The Onward Travel poster advises that the nearest taxi rank is in the town centre and that this is 15 minutes walk away, but it does not mark the location of the rank or even give the phone numbers of any taxi firms. By the time the last two train services arrive the station is unmanned and locked up. How helpful is all of this to travellers? Only passengers on a through ticket to Orkney (see below) are provided for. There is a big gap in bus services from Tain to Inverness in mid afternoon, and it would be quite simple for passengers at the main bus stop in Lamington Street to be advised that there is a railway station nearby with a train service at 15.45. It just needs co-operative action. 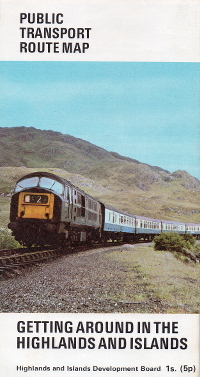 ScotRail used to advertise that the 17.54 Inverness to Kyle of Lochalsh due to arrive at 20.31 made a connection with the 20.40 bus to Portree. They stopped doing this after 2015 though neither the train nor the bus times have changed since then. The bus stop is by the old slipway, not visible from the station. No doubt the Abellio conductor would tell the passenger how to find the bus, but is there any way of alerting the bus driver to a potential passenger if the train is a few minutes late? I don't think I would chance that connection. In his February 2008 "Study of Connectional Possibilities" for the Highland Rail Partnership, Bob Barnes Watts observed "Despite the best efforts of various bodies, optimising the possible connection opportunities at this important interchange remain unfulfilled. There is no liaison between rail and bus operators to cater for advice regarding out-of-course running - the bus doesn't wait for the train and the train doesn't wait for the bus!" Has anything changed in eleven years? Other bus services which have been withdrawn include all but one of the connecting post buses between Lairg Station (2 miles distant from Lairg village) and the coastal villages of the north and north west. 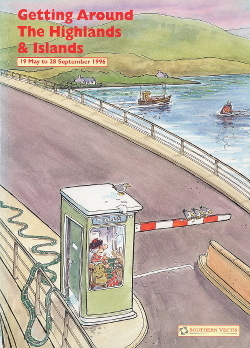 Postbuses were also withdrawn from Kinbrace. Richard Lochhead MSP is on the case of the non-connection between LNER's arrival from London Kings Cross at 20.05 and ScotRail's 20.05 from Inverness to Elgin which means a wait until 21.33 for the next train. Even between railway companies passenger convenience seems to get forgotten. [As shown elsewhere, provision of a double track loop in from Dalcross would allow the 20.05 to leave later]. It is not rocket science. What is needed is a bit of transport science, even common sense. Somehow the transport providers (of trains, buses and ferries), and the transport enablers/funders such as Transport Scotland, HITRANS, and the local authorities need to get together and sort this out. Make services work together, provide services of the right capacity at the right timings and frequencies; make it warm and comfortable (including at interchange points) and travellers will switch to public transport. Above all, travelling should be an enjoyable experience! PlusBus is a well established scheme which might be promoted even more. ScotRail could increase marketing of combined Rail and Sail tickets to Arran, Bute, Dunoon, Mull, Skye and the Western Isles. The one to Orkney sensibly now includes a taxi fare between Thurso station and Scrabster harbour. Travellers without a booked through fare need clear guidance too (as already highlighted). Abellio ScotRail has introduced bike hire at Inverness station. Stagecoach has agreed to run the first bus of the day from Lochardil ten minutes earlier so that passengers from that part of the city can connect with LNER's 07.55 train to Edinburgh and London Kings Cross. Traveline Scotland can be an effective online resource, but it is only as good as the input it gets from operators and councils or regional transport partnerships. Its suggested routing is sometimes convoluted, so it could be made more user friendly. HITRANS developed "an [online] itinerary and journey planner" in 2012/13 named JourneyGenie but this was never fully launched. Online resources can be immensely valuable, but are not an over-riding panacea. We must remember that a significant number of travellers will always require paper timetables, maps and tickets. Inverness station is soon to be modernised. Hopefully more attention will be given to signposting onward travel options. It would be good if Stagecoach updated and republished their map of bus stops in Inverness and the routes they serve. This should then be displayed prominently on the concourse. How much better it would have been to have the tourist office there too! Past initiatives to move the bus station closer to the railway station have foundered due to lack of a co-ordinated organisation to fund land purchase and project management. This idea is live again, but don't hold your breath. One glimmer of hope is that councillors are about to discuss how to put more of the "region" into the next stage of the Inverness City and Region Deal. This is the kind of article that our valued colleague Bob Barnes-Watts could have written so much better than me. His knowledge of timetables was tremendous and the advice he gave within and without the industry was invaluable. To travel on one of his suggested enhanced itineraries - with added gold plating to the vehicle(s), or to the route, was a joy. Two examples will show you what I mean. From Inverness to Fort William via Dalwhinnie "Interchange" meant enjoying different scenery than usual including Loch Laggan. It was only possible because he knew that Fishers Tours of Dundee ran fortnightly as a stage service from Arbroath to Fort William and that a train from Inverness called at Dalwhinnie at the right time. Also that meeting with a former MD of ScotRail happened to be on a Tuesday and the right Tuesday at that! The other was a journey from Inverness to Arisaig via Pitlochry for a HITRANS meeting. On a glorious June morning it meant a two hour earlier start from Inverness on the 06.50 train. Yule's bus took me to Kinloch Rannoch where a connection was made with the minibus to Rannoch Station for which I was the only passenger. Splendid scenery and the minibus ride was on a road new to me. At Rannoch, I climbed aboard the through train to Mallaig joining others going to the meeting from Glasgow. Well worth the early start. That was travelling as the enjoyable delight which it should be. Thank you Bob.